There is another member of St. Laurence House that I neglected to talk about. It is Simba, the wonder dog. 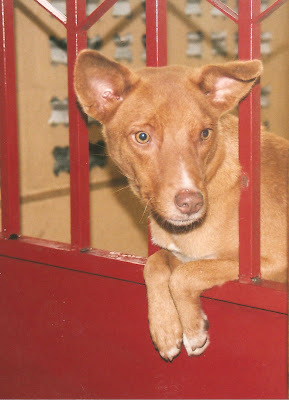 Simba, with the wild ears, is a lovable wild dog that was brought to St. Laurence as a guard dog. He can guard and barks to alarm the family if something is amiss, but mostly Simba just wants to be loved and petted. He loves cats, even when they are not sure they want his companionship. See his video "Simba, Wonder Dog of Freetown" on our youtube channel at www.youtube.com/SaloneNHA. Crazy Simba tangled up in knitting yarn! The perfect accomplice in mischief, Roo and Simba get along great!!! The above kitty, known as "Puss", is the newest addition to St. Laurence House. She hasn't much of a story to tell yet.